What's the meaning of the phrase 'Joined at the hip'? What's the origin of the phrase 'Joined at the hip'? The evocative expression 'joined at the hip' derives from the situation of conjoined twins. 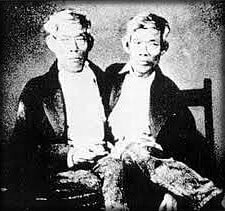 Chang and Eng Bunker (1811–1874) were a celebrated pair of conjoined twins and, being from Siam (as Thailand was then called), they are the source of the expression Siamese twins. The pair were internationally known in their day and their celebrity has led many to assume that the term 'joined at the hip' also originated with them. This seems unlikely as the Bunker brothers were joined at the sternum, not the hip. "The two organizations [Caltech and the Pasadena Chamber of Commerce] were so closely knit ... they were practically joined at the hip." While it is clear that the expression derives from conjoined twins. A pair of contenders from England are The Biddenden Maids. In the English village of Biddenden, Kent, an annual dole of food and drink is made to the poor every Easter. Accounts vary on how long this has been going on but claims are made that it began after the death of conjoined twin sisters born in Biddenden in 1100. Records show that the annual distribution is known to have taken place since at least 1605 and that, since at least 1775, the dole has included Biddenden cakes. These are hard biscuits that contain an image of twins, joined at the hip and shoulder. As with many old English folk traditions, it is impossible to separate fact from folklore and almost every aspect of the Biddenden Maids story is a source of dispute. Nevertheless, they are a pair of well-known twins who were 'joined at the hip', albeit not well-known in Pasadena in 1963. All the early figurative uses of the phrase are American and whoever coined it may just have been making a general, non-specific reference to conjoined twins. 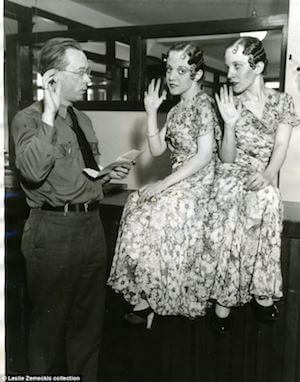 Better candidates as the source of the expression 'joined at the hip' are Daisy and Violet Hilton, a pair of British conjoined twins who toured US vaudeville and freak shows in the 1920s and 30s (seen here during their application for US citizenship). They qualify as being both well-known in the USA and to have been actually joined at the hip.